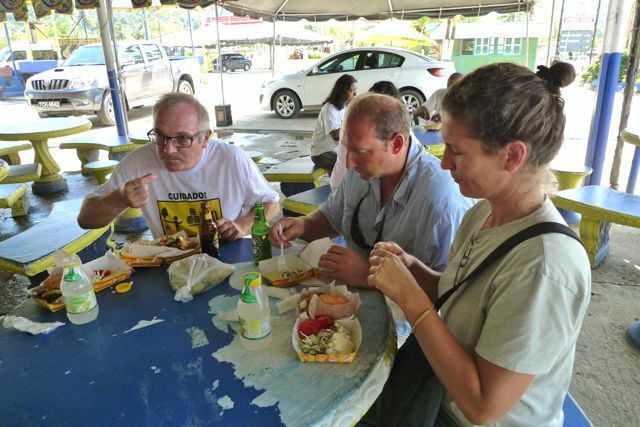 On our last full day in Trinidad, we met up with Harripaul at the airport and set off on a wonderful day of sightseeing and food. At the airport, we dropped off our rental car and jumped into Harripaul’s big, comfortable Kia. The first stop was the Abbey at Mount St. Benedict to enjoy the stunning view over the country. It was lovely and cool up so high. And even higher up, we could see terraced crops growing in the cooler clime. 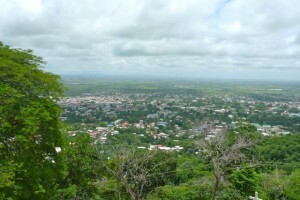 View from Mount St. Benedict. Then on to our primary destination, Maracas Bay, Trinidad’s most beautiful beach, on the north coast of the island. We stopped at the vista point just before the beach to admire the view of the beach and also to buy some chow at the roadside stand. (Yes, Trinidad is all about the food.) I’d never heard of chow before Trinidad – it’s a mix of tart fruit (we tried green mango chow and pineapple chow), salt, lime juice, hot pepper and herbs (such as chadon benny – Trinidad’s “cilantro on steroids”.) Chow could be quite addictive. View from the lookout point over Maracas Bay. The beach was indeed beautiful, but our first priority on arriving was lunch of bake and shark. Directly across the road from the beach, the bake and shark stalls lined the road. We wisely let Harripaul choose our spot. After all the hype, I was expecting to be disappointed; but no. Our expectations were exceeded. 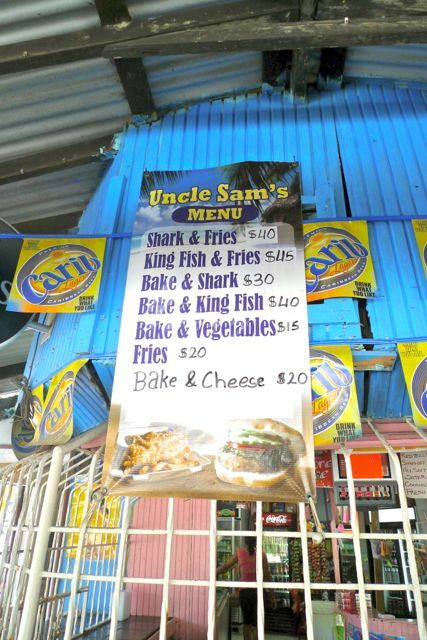 Bake and shark is truly delicious. 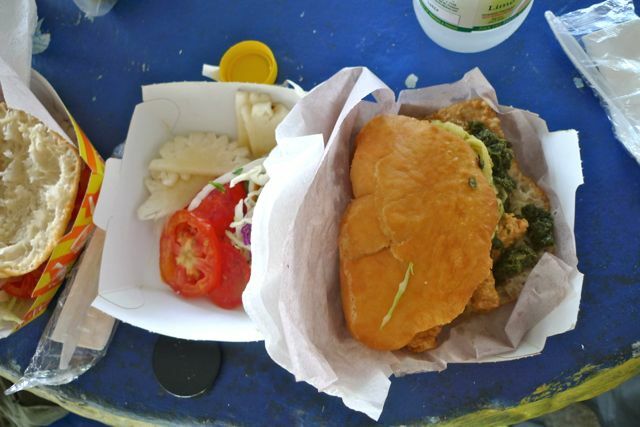 Perfectly fried small tender shark on a fresh bake (sort of a breadroll that is actually fried, not baked), and a choice of sauces and toppings: hot pepper sauce, garlic sauce, chandon benny sauce, tamarind sauce, sliced tomatoes, chopped cabbage, pineapple slices. Here is the menu. We all chose the bake and shark. Bake and shark in all its glory. After lunch, Pete and I waded in the lovely beach for a bit. The sand was so fine; like packed icing sugar (but not sticky). There were a good lot of people enjoying the beach; mostly Trinis but some foreign tourists too. 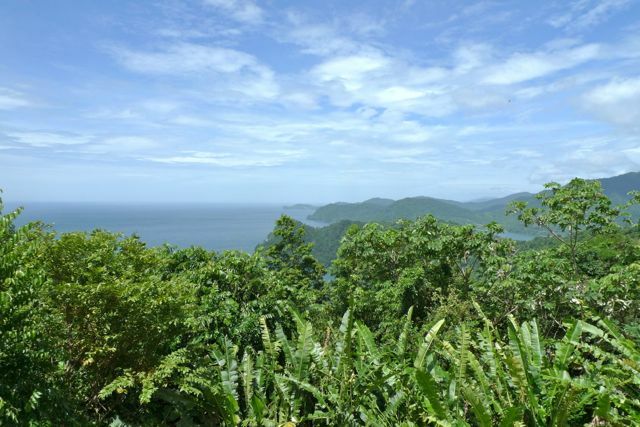 In the afternoon, we drove along the coast, stopping to look at the beautiful Las Cuevas bay. 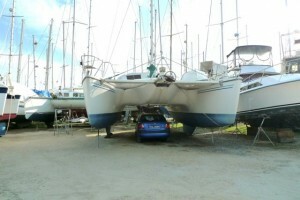 Then we headed inland, hoping to take a route through the rain forest back towards Port of Spain. Harripaul asked people along the way if the road was passable – there has been an unusual amount of rain recently. 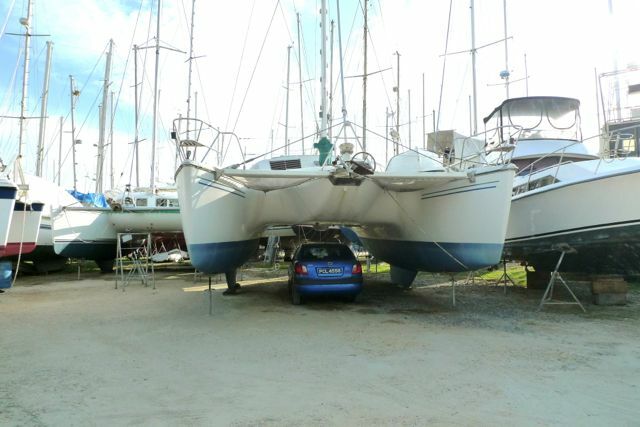 We didn’t get a conclusive answer until we met someone in a four-by-four going the other way. He said it was very muddy and didn’t recommend we try it. Ah well; the drive was fun: we saw some little towns, got caught in a taxi funeral procession (the slowest we’d seen Maxi Taxis drive in Trinidad), and admired the lush rain forest. We stopped by the road where a man was selling young coconuts from a wheelbarrow. We bought some – the water was so refreshing. Based on prior experience, I thought that I didn’t like coconut water, but today I discovered that I don’t like water from stale coconuts. If the coconut is really fresh, its water is delicious. If the coconut is stale, the water has a sour taste. 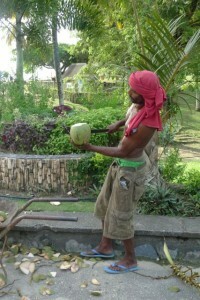 After we’d drunk the water, the man cracked open the coconuts with his machete and cut a sliver of husk for a scraper. We then ate the jelly using our scrapers. 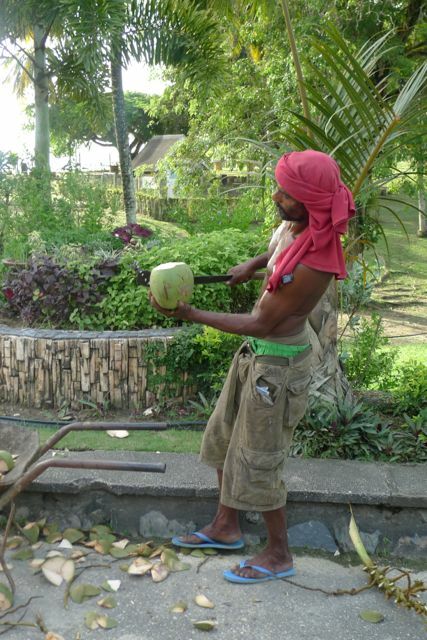 Man with machete and coconuts. 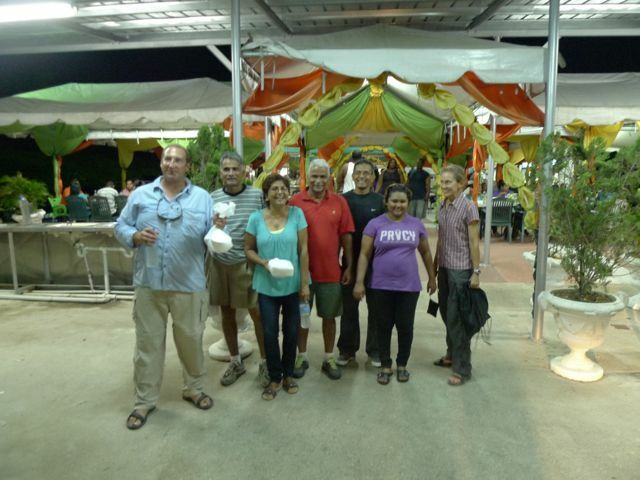 In the evening, we went with Harripaul and Maria and Sylvia and Tawhed and Manuel to a famous Muslim BBQ place in San Fernando. It was the place to be on a Friday night: the BBQ was good and the company too! 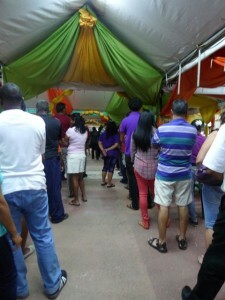 Waiting in the queue for BBQ. 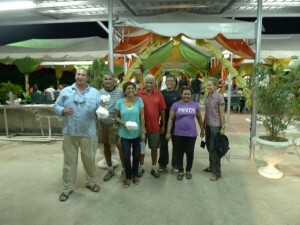 Group photo after a very happy day in Trinidad. This entry was posted in Trinidad by Jane. Bookmark the permalink. THIS was one awesome post!! I love the summary and I LOVE the photos! You all look great and so relaxed! I so look forward to each and every post. I continue to pray every night for your safety.